The newness and wonder of cooking is wearing off as I gain confidence and skills (although I use that term loosely). Without blood or other injury, it just isn’t as interesting. If your travel plans impact your cooking schedule and you don’t adjust your deliveries, what do you do with the extra meal(s)? The first time this happened, I offered it to a foodie friend who lives on a property with organic gardeners and an even bigger foodie landlord. I was shamed, and I learned. The second time, I brought it to a fellow Blue Aproner at work and he was delighted to take it off my hands. The third time, I sent a FaceBook message to another BA friend who had posted a rave about the meal I was offering. He and his wife were willing to take the chance that it involved salmon and it was a week old – they survived and loved it. If your husband is out of town and you don’t adjust your deliveries, what does that mean? Twice as much food for dinner? Twice as many dinners (but half are leftovers, still fresher and tastier than what you usually eat)? Invite someone over? After cooking my first meal under these conditions, I choose Door #2. 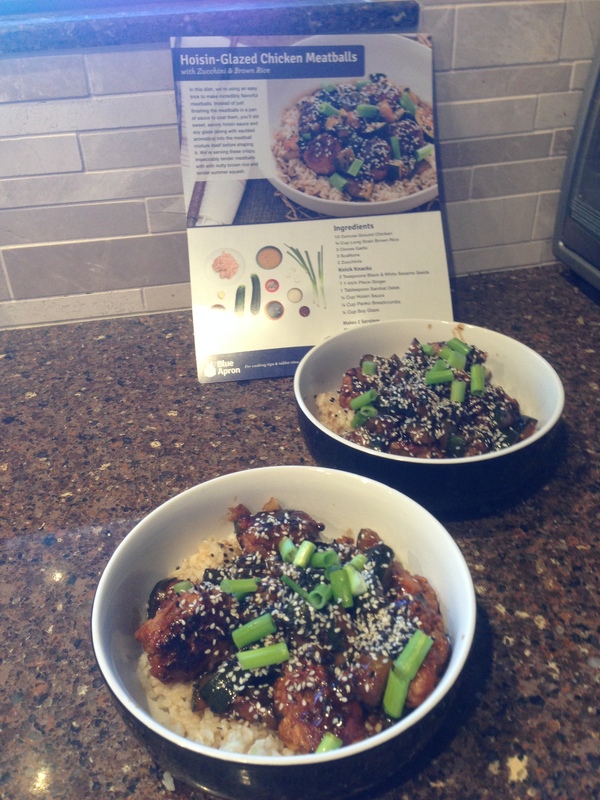 So sorry, Rich, that you were out of town for tonight’s Hoisin-Glazed Chicken Meatballs with Zucchini & Brown Rice. Wow, there was a lot going on tonight. A cacophony of flavors, if you will. 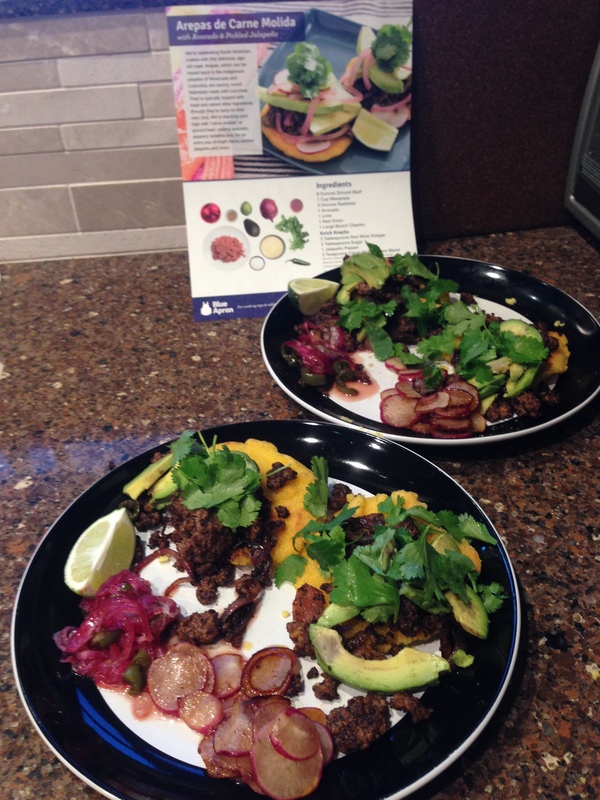 Arepas (savory round flatbreads made with corn meal), avocado and cilantro, sliced radishes, pickled onion and jalapeno, beef with spices and onion. It was hard to know where to start, so I kept everything separated on the plate and picked various combinations with every bite. And in a triumphant improvisation, I opted to pan-sear the radishes at the last minute because it’s well established by now that we still aren’t fans of raw radishes, but have learned to love them cooked. The chicken was already boneless and skinless, so I didn’t have to remember to pull the greasy skin off. 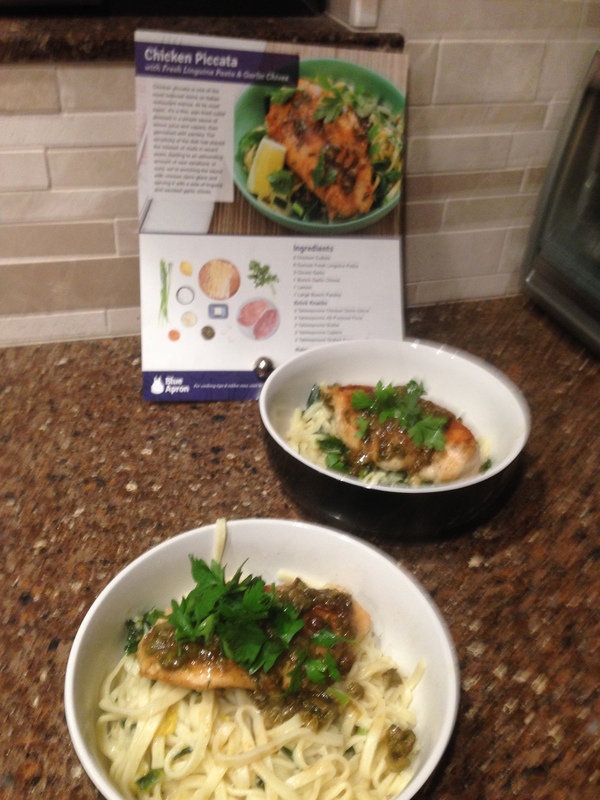 The sauce was lemon juice and capers – how can that go wrong? It can’t. The chicken was moist and perfectly cooked. Prep was relatively easy, Home Run! 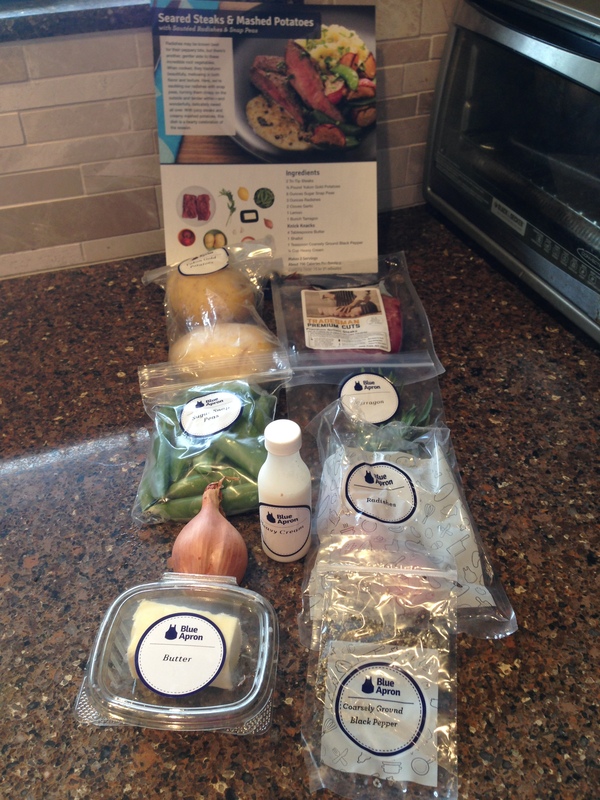 I’ve heard from two people that this was their favorite Blue Apron meal to date. Rich and I aren’t huge salmon fans, so I wasn’t sad to lose it. And I’m pretty sure that Scott and Vanessa were thrilled to inherit this meal, despite its age (7 days post delivery). 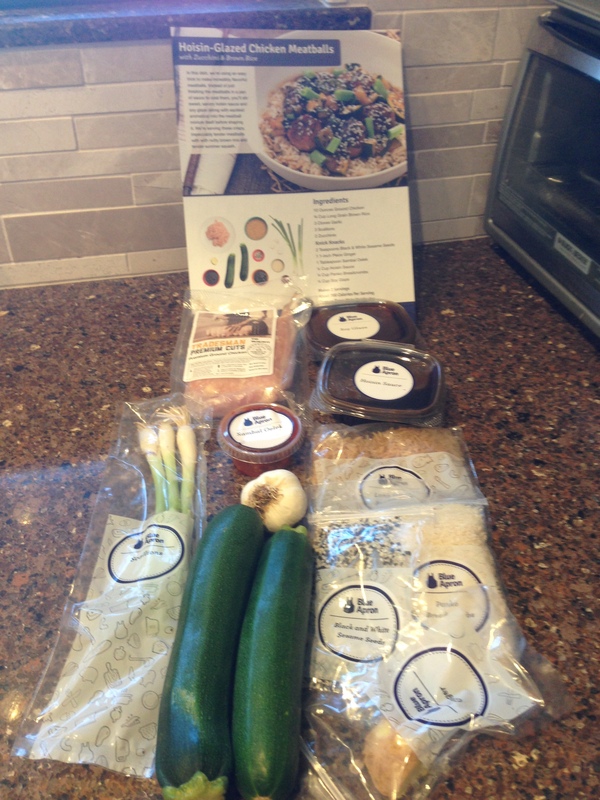 Love Hoisin sauce, love zucchini, love brown rice. Not much to go wrong here, and it didn’t. This was the first meal I had to eat by myself, and despite the soggy zucchini, I thoroughly enjoyed the leftovers for lunch two days later. Radishes? love ’em, now that I know how to cook them. Mashed Potatoes? I can honestly say that I’ve never mashed a potato before tonight. Meh, no big deal! Everything else? What’s not to love? I’m sad to say that this might be the first meal I have to toss (at least partially) because the fish is now 11 days post-delivery. I certainly can’t foist that off on someone else, and I’m not sure I’m brave enough to give it a try. But the rest of it sounds great, so I’ll take a look at the vegetables tomorrow night and decide if it’s worth adapting and giving it a chance as a vegetarian meal. Plan ahead for travel schedules – If you don’t have time to cook all three meals, or you’ll be cooking for yourself for a week, better to skip a delivery than have them stack up and either be given away or tossed. And since half the fun of cooking is Rich’s response (not to mention his help with cleanup), I’ll be more careful with my delivery schedule in the future. 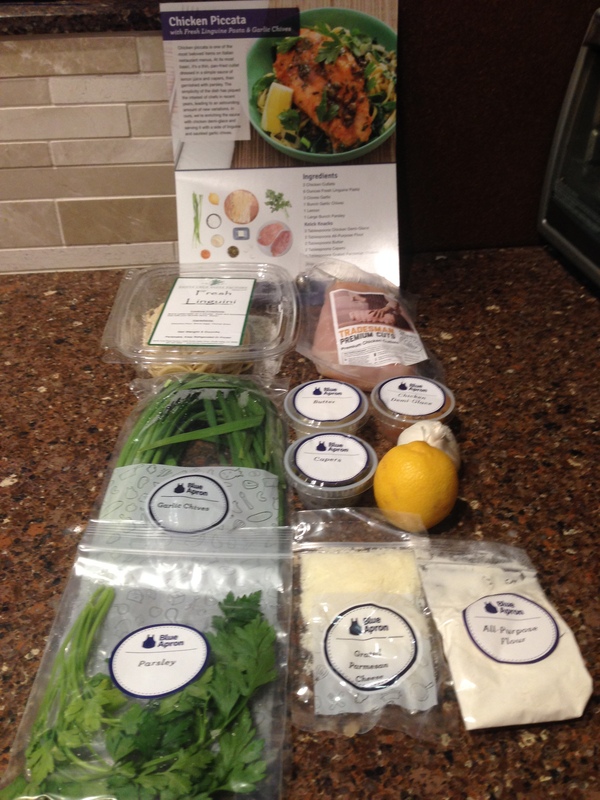 Leftover Blue Apron meals are still better than most things I would otherwise eat. My chopping skills are improving – I only wear my protective gloves (or as Rich calls them, my chainmail gloves) for grating and mandolining. It helps that I bought a spring-chopper for PITA stuff like nuts. I mashed my first potatoes ever. No big deal! 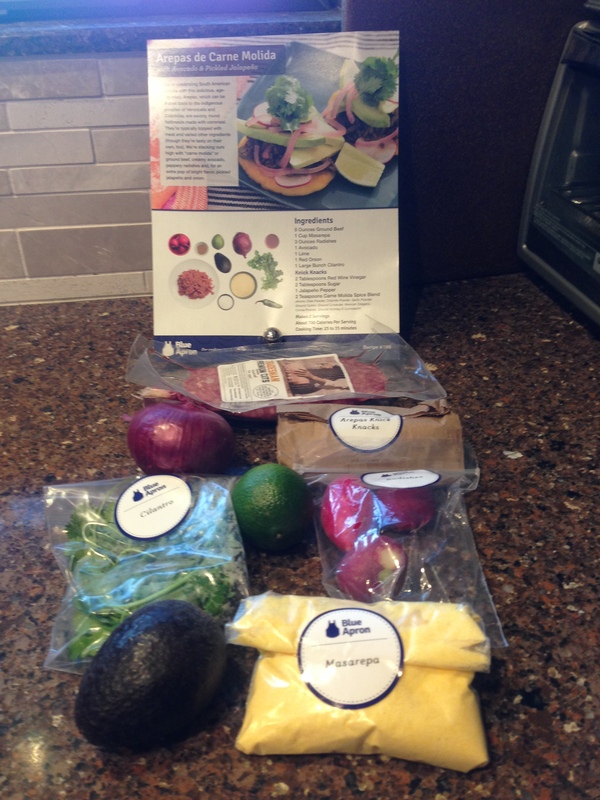 This entry was posted on Saturday, June 27th, 2015 at 8:23 pm and is filed under Blue Apron - Learning to Cook. You can follow any responses to this entry through the RSS 2.0 feed. You can skip to the end and leave a response. Pinging is currently not allowed.